segurachess comentó en ¿Qué quieres ver en chess24? The Norwegian Chess Federation has announced the four teams that will represent Norway at the 2014 Chess Olympiad in Tromsø. The top team, which features World Champion Magnus Carlsen on first board backed up by four more grandmasters, was described by the chairman of the selection committee as “the best Norwegian national team in history”. This is the best Norwegian national team in history. The first team in the open section consists exclusively of grand masters. We have a world champion, and some very good players who if they are in form can be a match for anyone. Magnus leads the way, but has a wonderful collection of strong players behind him; a great blend of creativity, experience, solidarity and tremendous will. This bodes well! The Norwegian Chess Federation has strong hopes of seeing the best ever performance by the Norwegian team at the Chess Olympiad, and is really looking forward to seeing this team playing at home in Tromsø in August. With live broadcasts on television and the internet, Norwegians can begin looking forward to a very exciting competition at the highest level. On the women’s side, we have also named an extremely experienced and strong team. These are the best players in the country, and they are committed to really performing at the Olympiad. This is a very solid squad. Both second teams will also be exciting to follow. There is a good geographical spread on the women’s side with players from Oslo, Stavanger, Bergen and Tromsø. 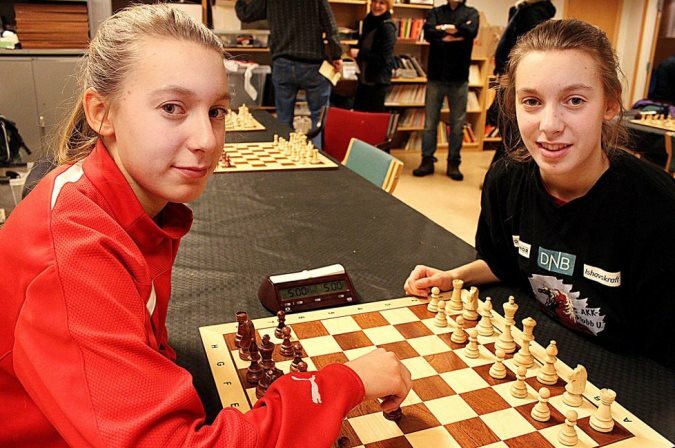 It’s unlikely Norway has been represented by twins before, and it is nice that the Machlik sisters also come from the host city of the Chess Olympiad. The board order will be determined closer to the start of the championship. In the event one of the first team players withdraws, he or she will be replaced by a player from the second team. Two of the players in each of the second teams are based on the commitment to talent in the national recruit teams. This applies to Aryan Tari, Johan Salomon, Monika and Edit Machlik. In the event that one of these players is forced to withdraw, they will be replaced by other young talents from the national recruit teams.